Anemos luxury pool villas are brand new villas in Crete , built with all luxury standards and they are decorated in modern style. Rates includes all facilities, 3 times per week cleaning and change , pool cleaning every three days. 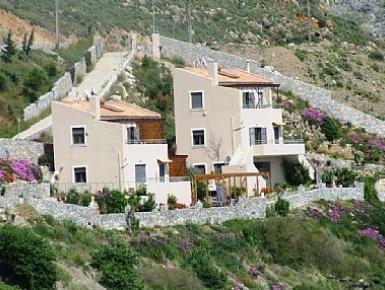 Each villa is 112 sqm in size in two storeys, accommodating 6 people in three bedrooms. Both of the villas provide a comfortable living room with working fire place, fully equipped kitchen, dinning area, three bedrooms and two bathrooms.The spacious well furnished terraces surround the 7 metre long pools and in this most commanding position there is a brick built barbeque for those glorious meals al-fresco. Between the two villas there is a common table tennis area.